Ocean City Town Hall is located at 301 North Baltimore Avenue, Ocean City, MD 21842; phone: 410-289-8887. 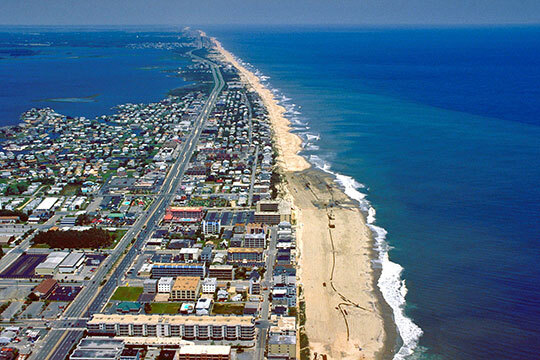 Photo: Aerial View of Ocean City, MD. Photographed by U.S. Army Corps of Engineers, not dated, [cc-by-1.0 (creativecommons.org/publicdomain/zero/1.0/deed.en)], via Wikimedia Commons, accessed June, 2015. Ocean City began in the resort business in 1875 with the opening of the Atlantic Hotel, on the boardwalk south of Somerset Street. Prior to its settlement, the island served as pastureland for mainland farms. The first town limits were at North and South Division Streets. By 1880 three major hotels, several cottages, the United States lifesaving station, a post office, two general stores, several churches, and a railroad station had been established in Ocean City. A railroad bridge built in 1876 coming into the resort at South Division Street provided a direct line to the mainland, and served as the primary means of transportation to and from the resort community. In 1890, the Sinepuxent Beach Company purchased all the land available from South 7th Street (now part of Assateague Island) north to 33rd Street and platted the land into lots, blocks and streets. The Towns corporate limits were extended form South 7th Street to North 15th Street in 1898. The 1890's saw the construction of additional hotels, casinos, cottages, a power plant and the advent of the resort's fishing industry with fishing camps located between South 2nd Street and South 7th Street. Pound fishing grew to support tourism as the major community source of income. An automobile/railroad bridge in 1910 replaced the original and the town's growth continued. The Fenwick Land Company and the Isle of Wight Land Company purchased the land to the Delaware State line and platted blocks and streets in the area that is now referred to as north Ocean City. By 1918 a number of Town Streets were paved and an automobile bridge was constructed from Worcester Street across Sinepuxent Bay to the mainland. Throughout the years, major fires and storms ravaged portions of town. Most notable are the fires of 1925 and 1929 and the storm of 1933. The two fires destroyed twelve city blocks including portions of the original town. The storm of 1933 destroyed the fishing camps and cut the inlet, reducing the part of Fenwick Island now occupied by Ocean City to an area of about four square miles. By now, more and more tourists were traveling by car and by 1933, Coastal Highway, was extended from the resort's northern limits to the Delaware State line. Growth in 1940s was slowed by the war. The next decade brought the first span of the Chesapeake Bay Bridge (1953) and more growth. Throughout the town's development, fill had been used to create land. The 1960s saw a great expansion in land creation and consequently the destruction of wetlands. Also the first high-rise, the Highpoint, was constructed in 1969. During this period public utilities were extended to the town's new boundary, the Maryland/Delaware state line. The early 1970s brought the completion of the second span of the Bay Bridge. Two major development boom periods occurred during the last three decades. The first occurred in the early 1970s which lasted for three years and created north Ocean City's "High-Rise Row." The second and more recent between 1981—1985 was largely driven by renewed interest in purchase of second homes in the resort community. Today, 95% or more of the land located within Ocean City has been developed. Town of Ocean City Maryland Planning and Zoning Commission, Comprehensive Plan, 2006, www.oceancitymd.gov, accessed June, 2015.